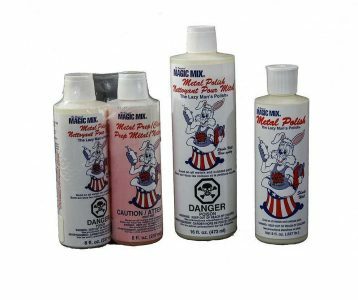 Magic Mix Metal Polish delivers shine and protection to aluminum, stainless steel, chrome, gold, silver, copper, brass and magnesium. Other paste-type polishes only permit small areas to be shinned at once, they cannot be allowed to dry beacause the polish becomes very difficult to remove. But with Magic Mix Metal Polish, users can polish an entire surface, allow it to dry and simply dust it off. What’s left is a beautiful shine without the repetitive rub-on, wipe-off exercise required by other polishes. Magic Mix Metal Polish will be added to Cart!